but ONLY in AURA…fine by me! At MY Benjamin Moore Store…. turned out to be a person I Knew! 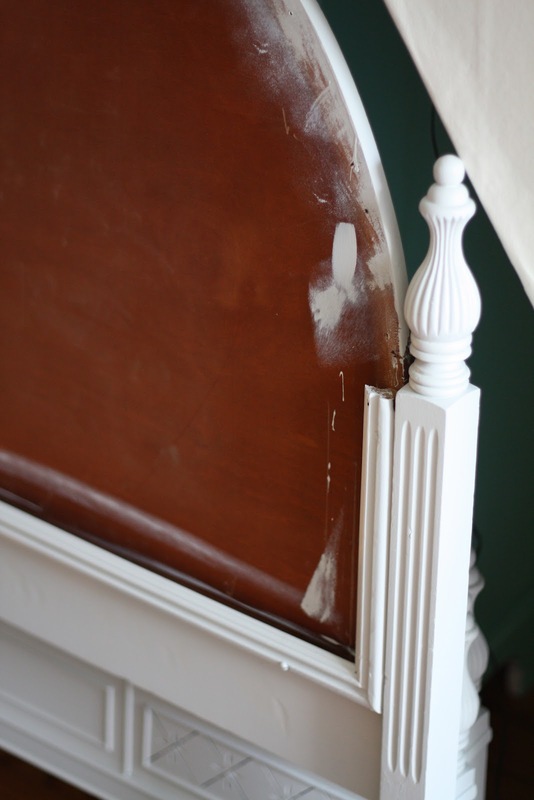 The bed was a breeze to refinish. and then painted the body with my new “Perspective”. as it was intact and I did not want to replace it immediately. 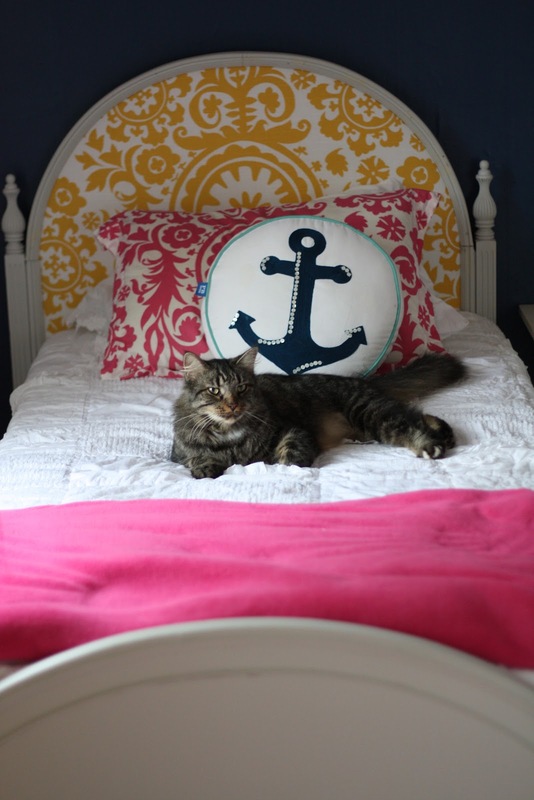 …..which coordinates with other fabrics I have used in Phoebe’s room. are an affordable, stylish way to makeover the fabrics in your home. ALL the rest of the bedding we had.. The table is the “DEBUTANTE VANITY” from Land of Nod which she got for her 6th Birthday. 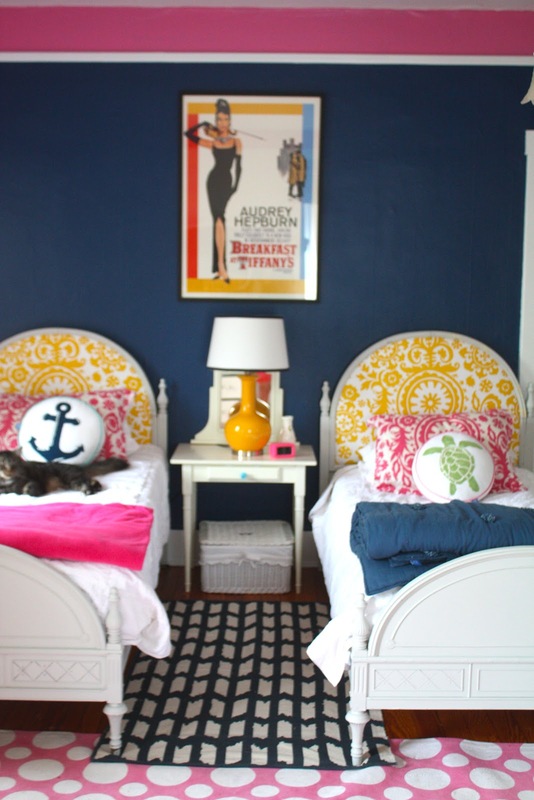 …click here to see how this bedroom won the Kids Room Contest at The Washington Post! Not bad for TWO WHOLE new/old Beds! 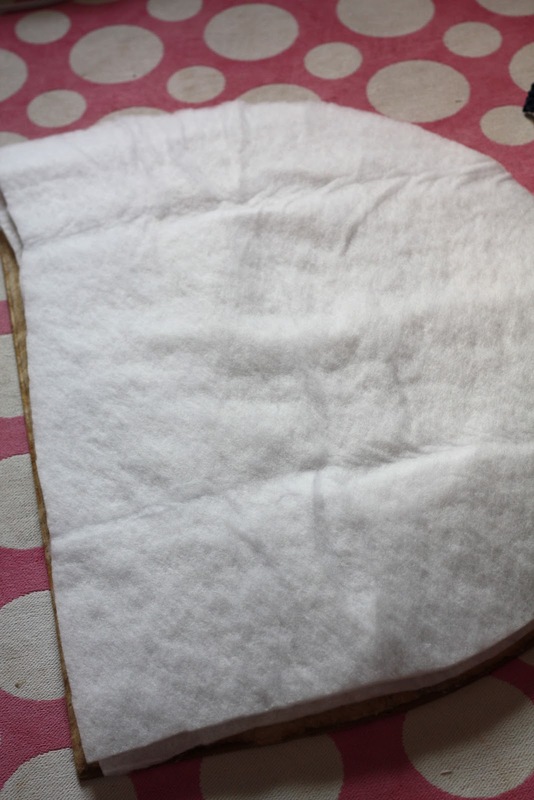 …..and I could have NOT gotten the quilts if I was looking to save more, and used random ones we have laying around…. SO FAR…this is one of the best deals Yet!!! IN THE UPPER LEFT AHND CORNER OF MY BLOG!!!! The Johnsons- Deep in the Heart of...Arkansas?!! I L.O.V.E. the room! You did such a great job with the beds. bravo!!! they look amazing and so perfect in there! love the yellow fabric! Thanks Cassie!!! I love the Happy Yellow fabric as well…. WOW!!!!! Those look absolutely amazing!! What a great transformation! Thanks Ali!!! I still can’t believe I got them done so fast!!! Amazing find on those beds!!!!!!!!!! And I love Phoebe’s new room and the upholstered headboards…….I just finished two myself – we must be on the same page!!!!!!! LOVE!!!!!! Great Minds..and all that jazz! Holy cow! Those beds turned out MONSTER AWESOME! Love the room so much! The beds are fantastic! Not to mention that the entire room is just beautiful. The layering of bold colors is so right! 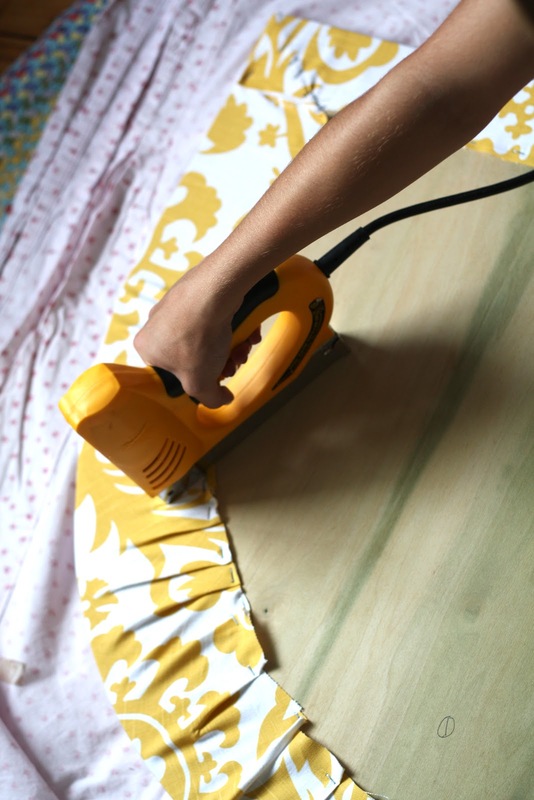 I love that yellow print fabric too – I put it on two chairs and they sold lightening quick! Thank you Sarah…I would like to move into Phoebe’s room!!! Those beds were a CRAZY deal! You make it look so easy! 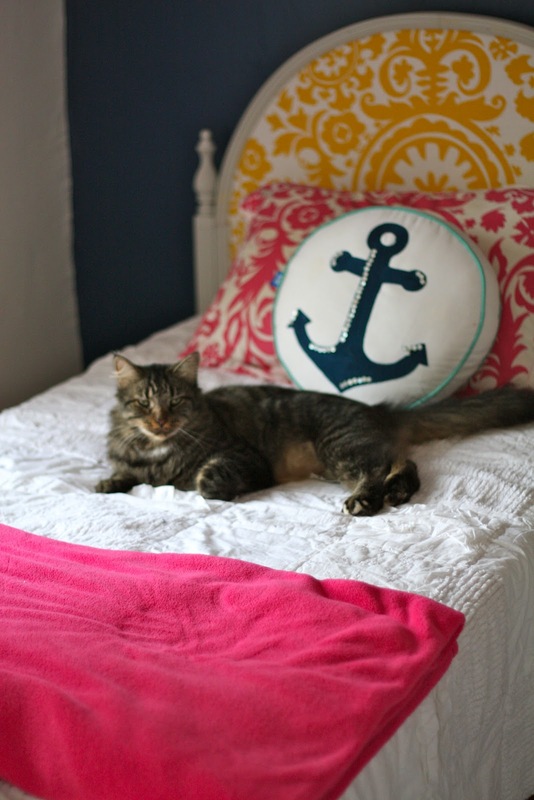 Love Phoebe’s room – just perfect for a ‘tween. ahhhh Thanks Alison…you are so sweet!!! This may be one the BEST before/after diys ever!!! I Luuurrrve your style. THANKS Elizabeth…I read your bio and To Kill A Mockingbird is my Favorite Movie of ALL time!! The beds turned out absolutely amazing! I love all the fabrics you chose. Thank you Mary!! !I love the fabrics and colors as well. Have a Great day! I love this room. Would you share the color on the walls? Words cannot describe how much I love these beds, the room EVERYTHING!Just awesome!!! Chrissie, Thank you for your kind words!!! We think the room rocks! What a fun makeover! You did a great job and I love the color combo! 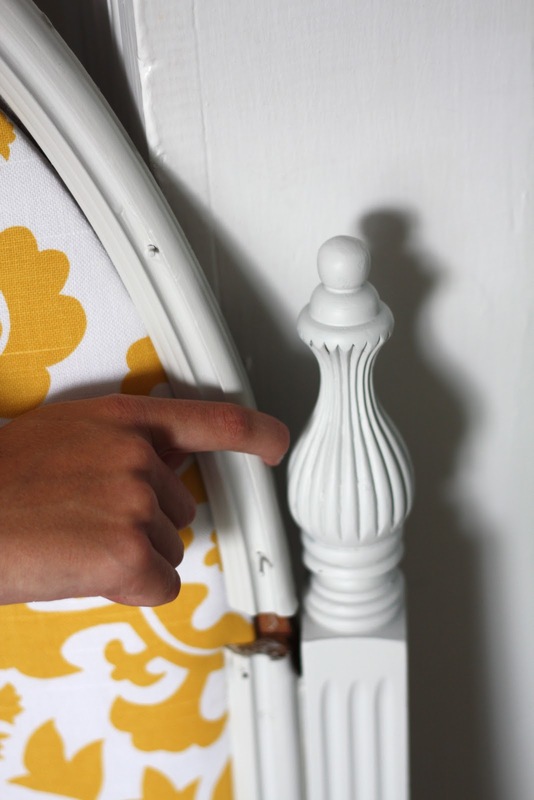 Why would anyone PAINT over Antique Furniture.People spend Hours trying to get previously painted Antique Furniture back to the Original Wodgrain Finish because the Wood is Naturally Nice! Then put a nice Antique Oil or Varathane on it. 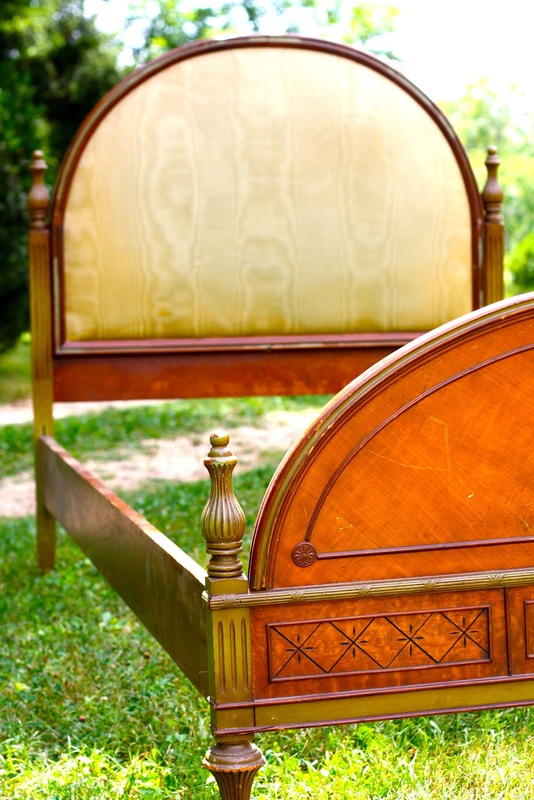 It is no longer Authentically Antique once you paint it without doing alot of work of Course. You are SO right, and I wholeheartedly agree, too often we paint over beautiful wood, and strip a piece of it’s value and inherent beauty. 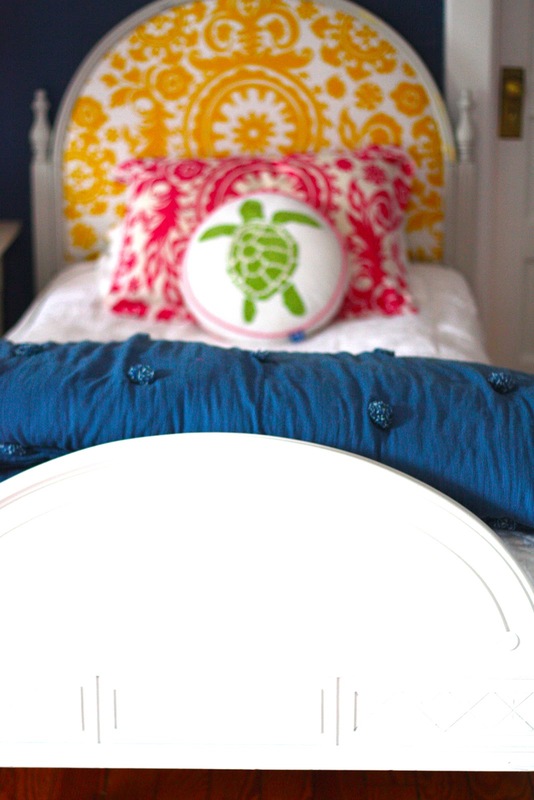 I love our beds painted, however, that is the style my daughter wanted for her teen bedroom. Wood was “too old”…sometimes, you can’t win for losing, but I do appreciate your comment. It is food for thought. Lizzie, Thank you so much! Are you kidding me?! Those are beautiful, I’m stunned at how much you paid for all that. I need to start visiting yard sales more often. You did an amazing job, that whole room looks divine. Lesli, I enjoyed seeing your makeover on Apartment Therapy today! I knew you would get mixed reactions, but that’s the fun of that place. I LOVE the makeover and I know you and Phoebe do too. You’re up to over a 100 comments over there! Thanks Bettsi…Yeah…there is a bit of a debate going on over there…but hey, They are talking about it and it is all good! gorgeous! you’ve honored these pieces by giving them a stunning new “life” with your daughter. i think you can only make yourself (or daughter!!) happy when you fall in love with antique/vintage wood furniture and not worry about others. as a wood furniture refinisher, i struggle with painting each and every piece in a way that allows the piece to be enjoyed and appreciated by the user. isn’t that worth something, too?? i wouldn’t paint a “valuable” antique just to update a look and have passed on pieces that didn’t need my style of refinishing. Still… how many of us have an UGLY “antique” haunting us in a dark corner of our house that we’re afraid to update and ENJOY? Love garage sales–they bring out the creativity in us! you are so right..in the words of Tim Gunn….they are a “make it work” moment! I can’t wait to show this to my daughter. I’d like to change her room up a little bit and she’s afraid it’s going to be boring. 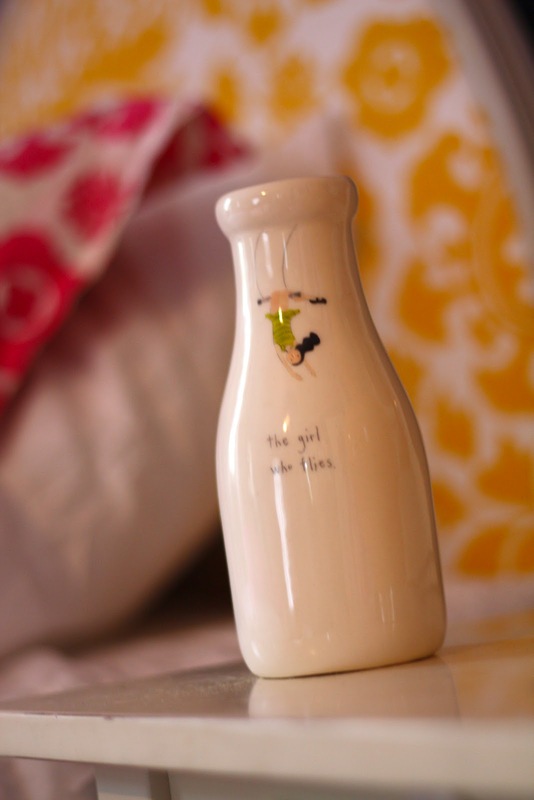 Your daughter’s room is the perfect inspiration room! Beautiful job! Thank you so much!!! Her friends like her room sooooo much.They even put it in the middle school yearbook Ha! How cute is that! What a great score and a even greater make-over. KUDOS! Your girls, cat and dog are lucky! What a fun room! And those beds were the score of the decade! I love it! So vibrant. My room didn’t look anywhere near this great growing up. The colors are amazing! What a deal on the beds! Oh and the adorable cat :). He is fierce! Fabulous room! Just goes to show that great style doens’t have to cost an arm and leg!! How fun to be a teenager and have such a great room! Thanks Joan, She LOVES her new room…it works on all levels…and looks amazing to boot! Leslie! You did a fabulous job on this!!! I love it! You are so talented! Thanks Lisa, That is a high compliment coming from someone I admire sooooo much!!!! Thank you! Hello, I like your post and that bed was cute. I like it and hope to have that in my house. Thank you for sharing. What a beautiful room. It is full of personality and colour and those beds are fabulous. If someone sold them for $25 they couldn’t have been too highly prized could they? Looking forward to reading more of your ‘old’ blogs as I’ve just discovered you. 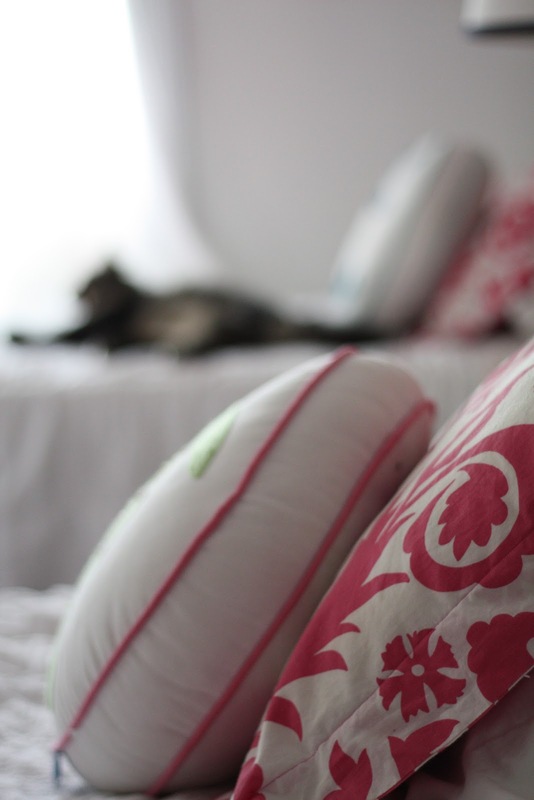 i would love to feature your bed makeover on my blog if that would be ok please let me know. Great article. If you need to combine 2 twins safely for guests or to save money, I found the Easy King on Amazon. Cool invention that works. http://www.ckisolutions.us is the place that invented it. There is a neat video on that website or on Amazon. Next Post FOOD FOR THOUGHT – CAN DIY GO TOO FAR ?? ?